Look no further than Baycrest Lodge - just a stone's throw from the calm blue shores of the Great Lake. 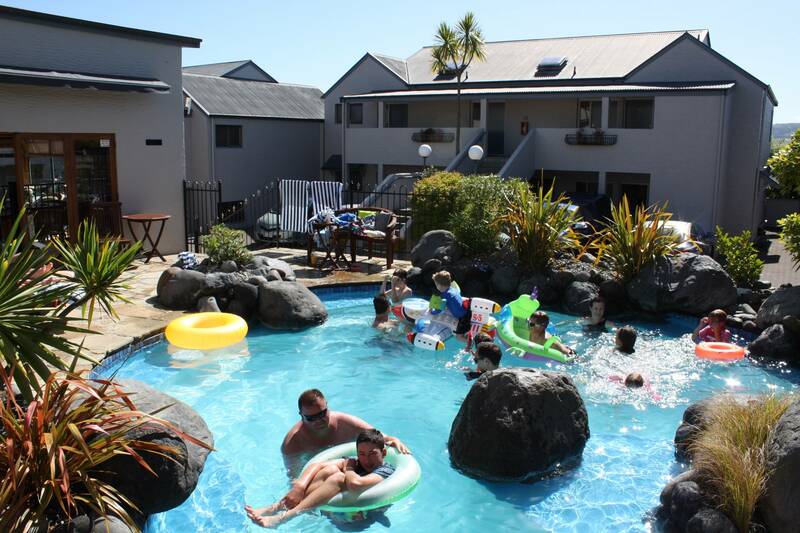 We are proud to be offering a professional yet relaxed Taupo motel accommodation. Thermal pools or spa baths, Lake views, outdoor heated pool, king studios and family rooms. Call us direct for best pricing option on your next stay. Experience the latest in quality service and surroundings, where traditional elegance blends with a restful ambience. Baycrest Lodge is 100m from the main swimming beach of Great Lake Taupo. All 16 units are spacious and elegantly appointed and have tasteful european bathrooms and fully self contained kitchen facilities, including fridges, ceramic hotplates and microwaves. Ground floor suites (no views) have individual hot thermal tubs, up to 50'C. First floor suites (Great Lake Taupo views) have large champagne spa baths, balconies and superb lake views. The family room options can have either singles or a super king bed as well as the queen bed. Some suites interconnect to make more sleeping configurations. All the suites offer wireless internet (limits apply), Sky's all new 'Guest Select' meaning 50+ TV channels in every room and 32" LCD TV's with inbuilt DVD player. Baycrest Lodge also has a stunning swimming pool thermally heated up to between 30'C and 35'C all year round. There is a guest bar and a guest laundry on site. Baycrest Lodge is close to a number of restaurants and is about 1 kilometre (an easy walk) from the town centre. We look forward to hosting you..